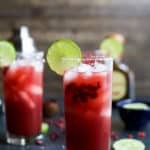 POMEGRANATE MARGARITAS an easy cocktail recipe you can rock all year round! Made with fresh ingredients. Cheers to the BEST Margarita Recipe ever! Add tequila, grand marnier, lime juice, orange juice, pomegranate juice, and agave nectar to a cocktail shaker. Cover. Shake. Serve over ice with a lime wedge and pomegranate ariels.